I’m so glad I had my camera ready when the nurse came to our hospital room to officially capture our son’s tiny footprints for posterity. I took pictures of the entire process, and I really treasure them. I’ve heard that not all hospitals take footprints these days, but if yours does, it’s likely they will use a product called the Kleen-Print disposable footprinter, which includes a panel for each of Baby’s feet, plus Mom’s fingerprint. Ask to keep this! Not only is it a cute keepsake, but you can actually get a few more uses out of it. And, since the ink is only on the underside of the “micro-thin film” panel, Baby’s foot doesn’t even get dirty. 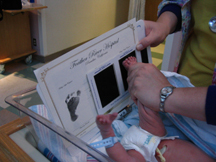 I brought my baby book to the hospital, asked the nurse to take a second set directly onto the book (pictured here), and then later at home I used the same footprinter to do his hands, as well. Many midwives use this product as well, and in fact you can find it online for less than $3 apiece. If you’re worried about messing up your baby book, just use a separate sheet of cardstock to get the print and adhere it to the page. Or scan into a computer and print that print!